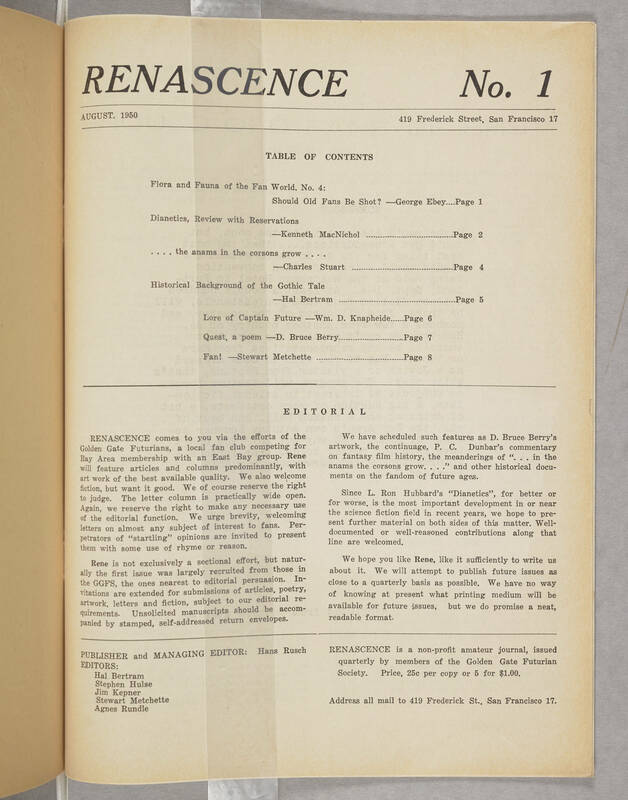 Renascence No.1 August 1950 419 Frederick Street, San Francisco 17 Table of Contents Flora and Fauna of the Fan World, No. 4: Should Old Fans Be Shot? - George Ebey... Page 1 Dianetics, Review with Reservations - Kenneth MacNiehol... Page 2 ... the anams in the corsons grow... - Charles Stuart .... Page 4 Historical Background of the Gothic Tale - Hal Bertram ... Page 5 Lore of Captain Future - Wm. D. Knapheide... Page 6 Quest, a poem - D. Bruce Berry.... Page7 Fan! - Stewart Metchette... Page 8 EDITORIAL RENASCENCE comes to you via the efforts of the Golden Gate Futurians, a local fan club competing for Bay Area membership with an East Bay group. Rene will feature articles and columns predominantly, with art work of the best available quality. We also welcome fiction, but want it good. We of course reserve the right to judge. The letter column is practicallt wide open. Again, we reserve the right to make any necessary use of the editorial function. We urge brevity, welcoming letters an almost any subject of interest to fans. Perpetrators of "starling" opinions are invited to present the with some use of rhyme or reason. Rene is not exclusively a sectional effort, but naturally the first issue was largely recruited from those in GGFS, the ones nearest to editorial persuasion. Invitations are extended for submissions of articles, poetry, artwork, letters and fiction, subject tou our editorial requirements. Unsolicited manuscripts should be accompanied by satmped, self-adressed return envelopes. We have scheduled sugh features as D. Bruce Berry's artwork, the continuage, P. C. Dunbar's commentary on fantasy film history, the meanderings of "... inthe anams the corsons grow..." and other historical documents on the fandom of future ages. Since L. Ron Hubbard's "Dianetics", for better or worse, is the most important development in or near the science fiction field in recent years , we hope to present further material on both sides of this matter. Well- documented or well-reasoned contributions along that line are welcomed. We hope you like Rene, like it sufficiently to write us about it. We eill attempt to publish future issues as close to a quarterly basis as possible. We have no way of knowing at present what printing medium will be available for future issues, but we do promise a neat, readable format. PUBLISHER and MANAGING EDITOR: Hans Rusch EDITORS: Hal Bertram Stephen Hulse Jum Kepner Stewart Metchette Agnes Rundle RENASCENCE is a non-profit amateur journal, issued quarterly by members of the Golden Gate Futurian Society. Price, 25c per copy or for $1.00. Address all mail to 419 Frederick St. San Francisco 17.